“I don’t want to do it!” Fara hissed. The French tourist’s eyes widened with fear as we stood on a wooden platform, 1000 feet above sea level, on the western slope of the Osorno volcano. 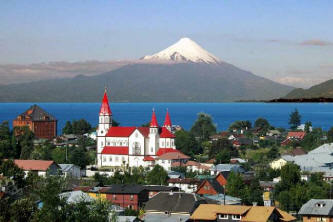 Glacier-capped Osorno is often referred to as the Chilean Mount Fuji. It’s one of the most active volcanoes in the country, with 11 eruptions recorded since the 16th century. As I peered down the endless steel cable that would send us flying through treetops and over deep canyons, I was suddenly afflicted by some first-timer doubts of my own. What if the pulley breaks? What if I get stuck on the line before reaching the next platform? What if I crash into the tree? What am I doing here?! Fara was strapped onto one of the professional guides for an assisted ump into the tree canopy. The rest of the tourists huddled around the massive tree trunk and looked on apprehensively. Barb, an American woman in her mid-sixties and dressed entirely in black leather and matching sunglasses, exclaimed, “If I can bear children than I can do this!” and belted out an appropriately hearty laugh. Barb’s friend Cheri did not look as self-assured. A long, shrill scream shattered the chilly forest silence as the trembling Fara leaped into the open. As she did this, an inordinately large bumblebee that sounded like a small motorcycle began to accost our little group and destroyed whatever order there was in our disorderly line for the canopy jump. Next, Cheri tiptoed up to the front as if being led onto the pirate’s plank. “Just scream your fear out! Yell like Tarzan!” I yelled, trying to cheer her on as I battled my own devils. A moment’s pause and off she went, letting out a resounding holler that began the moment her feet left the platform and did not end until her red-jumpsuit-clad body swung onto the next platform, 100 feet down in the trees. My turn. I moved to the edge of the platform and the guide hooked the sole ring of my harness to the cable. “Jump, lift your legs and pull down on the cable if you need to reduce speed,” the guide instructed. An adrenaline-charged zip line adventure was just one lurch away from me. Osorno stands triumphant over the southeastern rim of Llanquihue Lake, in the mesmerizing Lake District of Chilean Patagonia. At 8,701 feet, the volcano can be seen from the Pacific Ocean, as it was by Charles Darwin in 1835 during the second voyage of the Beagle. Many European immigrants settled in this area and founded towns that resemble Swiss villages along the rim of the lake. Frutillar, with its German museum and teahouses, and the rose-lined town of Puerto Varas are two of the more popular destinations here. With its sapphire lakes, ancient forests, snow-capped peaks, and emerald cascades, this is one of the most visited regions of Chile. The Lake District is also a haven for eco-tourism and adventure travel. The Vicente Perez Rosales National Park encompasses most of the area. Kayaking, white-water rafting, canoeing, hiking, trekking, horseback riding, fly-fishing; the wide range of outdoor activities offer an up-close view of this natural paradise. 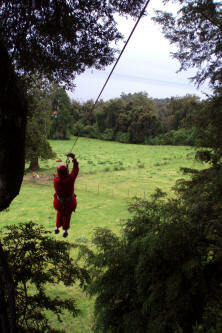 Canopy Lodge Cascadas was the first zip line (or “canopy” as it is called here) in Chile. It was constructed in 2002 by a team of experts who drew on their experience in the rainforest canopy lodges of Costa Rica, where scientific researchers who needed a practical way of getting from one tree to another invented the activity. More than a mile long, this zip line is the longest in Chile. The entire glide, with steel cables that stretch along 14 platforms, takes about two hours to complete. Oblivious to these particular facts, I stood on edge of the first platform, took a deep breath and jumped into thin air. Quickly, my fear melted as I flew between the branches of ancient lenga and coihue trees. I felt sheer pleasure as I listened to the hum of the wind against my ears. The steady zzzzz of my movement along the cable eased me and simultaneously heightened my perception of the profound silence of the forest. My adrenaline was surging and instead of pulling down on the cable to slow down, all I wanted to do was to go faster. About 30 minutes later, we encountered the diva of this circuit: an 820-foot-long stretch of cable suspended 311 feet over the treetops. 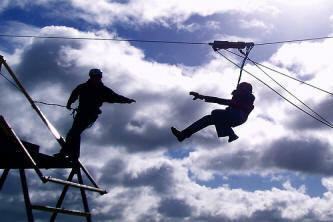 Zip liners fly over a wide canyon during a glide that lasts over a minute. It’s enough to paralyze more than one intrepid traveler. Those who manage to turn their heads during the fretful trip can catch a glimpse of a stunning panoramic view of the lake. After the canyon plunge, we breezed through the rest of the circuit, practicing our yells in different registers as we gained in confidence. During another memorable stretch we zipped over a herd of cows that were pasturing on the green foothills of the giant volcano. Near the end of our two-hour adventure, I bumped into Fara again. Her face was flushed and she was beaming. She had defied her demons and decided to go solo for the last few jumps. 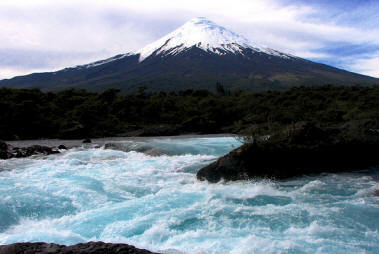 Osorno Volcano, for one proud tourist, would be remembered as a journey into fearlessness.